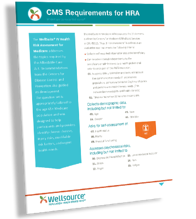 The WellSuite® IV Health Risk Assessment for Medicare question set is designed to help health plans and providers identify chronic disease, injury risks, modifiable risk factors, and urgent health needs. It is tailored to the age 65+ Medicare population. Recommendations from the Afforable Care Act and the Centers for Disease Control and Prevention guided its development. 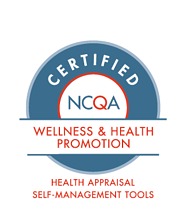 With its NCQA certification for Wellness & Health Promotion Health Appraisals, our WellSuite IV Medicare HRA continues to meet the Member Connections standard for MEM 1 and PHM 4. Download the tip sheet to learn more about the 37 elements outlined by Centers for Medicare & Medicaid Services.